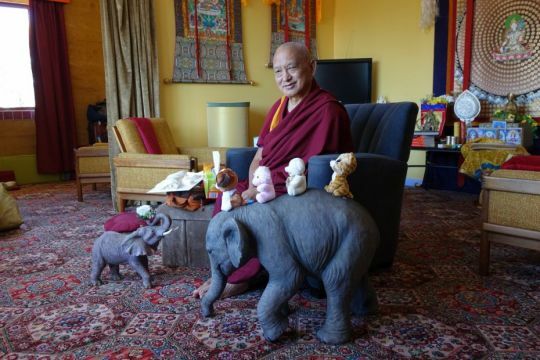 Lama Zopa Rinpoche with elephants, Bendigo, Australia, October 2014. Photo by Ven. Roger Kunsang. Lama Zopa Rinpoche sent the following advice to a student who had slowly drifted apart from his son until there was no contact between them. The student had also lost two partners to cancer. It is very good if you keep a lot of the eight auspicious signs. Keep different kinds—cloth, thangkas or wooden ones—all together or separate. Also there are many images of the four harmonious brothers, so you can try to get different kinds and have them around. 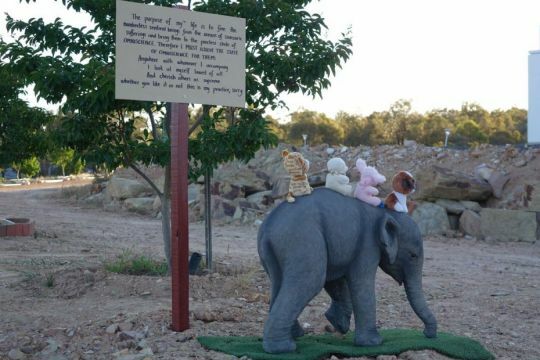 Offering elephant at The Great Stupa of Universal Compassion, Bendigo, Australia, November 2014. Photo by Ven. Roger Kunsang. Yes, it is karma, that is the basic thing. The eight auspicious signs and the four harmonious brothers are for protection from harm and for success. Do your practice well. Abandon negative karma as much as possible and practice good karma. Especially transform your mind from ego, from self-cherishing, to cherishing others and if possible into bodhichitta.